Fuel economy and a flexible floor plan are this Honda's hallmarks. Those who like their small cars big on the inside will find the Fit a good fit. Adult-sized room front and rear, plus usable cargo space, is rare in a subcompact. Rare, too, are trips to the gas station in the Fit, with an EPA-estimated 28 miles per gallon in the city and 34 on the highway. Honda fit is a fun, reliable car you can count on. It is a good car. Solid, reliable. The ac could be a little bit better. Other than that I have had very few issues with it. It is a good size. Comfortable for me, a friend, and a dog. The hatch back really allows it to hold a lot more than I first anticipated. I can use it to go on long car trips and car camping and carry many supplies. I have also used it to haul furniture. The seats are comfortable and the sight lines are good. I like that it comes with a jack to connect my phone to it with a male-male cord. I got a white one, and I do sort of wish I could have a different color but that was all they had at the time. The Honda fit is a reliable, safe and economical vehicle. I love my 2008 Honda fit. There is surprisingly a lot of cargo room in this car thanks to the wonderful magic seats that Honda is famous for. Gas mileage is great: up to 40 mpg on the highway using cruise control. I have had no mechanical issues and have been vigilant and on schedule with oil changes and regular maintenance. There is a bit of road noise but nothing that is a deal breaker. Although the car is small, I have never felt unsafe in it. And I love being able to park my car in the tightest parking situations! The Fit is an all around well made, comfortable, quality car that is affordable for fairly small budgets! I absolutely love my Fit. I have had her since she was brand new and I will keep driving her as long as possible! She is comfortable to be in as driver or passenger. I am tall and thick so i was quite surprised how roomy she is for such a small car. The interior storage and cargo options are way better than a lot of full size sedans I've been in. Gas mileage is higher than what I see other cars around me averaging and parking...I can always find parking because she is so compact and has an awesome turning radius. 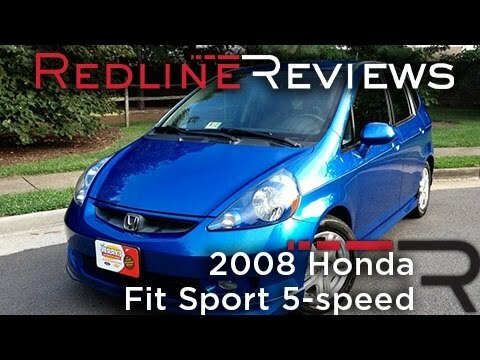 HONDA IS RECALLING MODEL YEAR 2007-2008 HONDA FIT VEHICLES. DUE TO AN ERROR DURING INSTALLATION OF THE WIRING HARNESS FOR THE COMBINATION SWITCH THAT CONTROLS LOW HEAD BEAM FUNCTION, THE WIRES FOR THE LOWER BEAM CIRCUIT WERE PULLED TIGHTER THAN INTENDED. AFTER REPEATED USE OF THE HEADLIGHT SWITCH, THE ELECTRICAL CONNECTOR TERMINAL FOR THE LOW BEAM HEADLIGHT CIRCUIT CAN BECOME WORN AS A RESULT OF THIS TENSION, WHICH CAN RESULT IN LOW CONDUCTIVITY AND CAUSE AN ACCUMULATION OF COPPER OXIDE IN THE AREA OF THE CONTACTS. THE LOW BEAM HEADLIGHTS CAN BECOME INOPERATIVE DECREASING THE DRIVERS VISIBILITY AS WELL AS THE VEHICLES VISIBILITY TO OTHER DRIVERS, INCREASING THE RISK OF A CRASH. DEALERS WILL INSPECT THE LOW BEAM TERMINAL AND PERFORM NECESSARY REPAIRS FREE OF CHARGE. THE SAFETY RECALL IS EXPECTED TO BEGIN ON OR BEFORE JANUARY 21, 2011. OWNERS MAY CONTACT HONDA AT 1-800-999-1009.